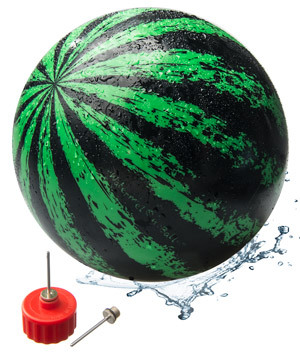 Watermelon Ball: Competitive pool game played with a unique water toy. You should never play with your food. 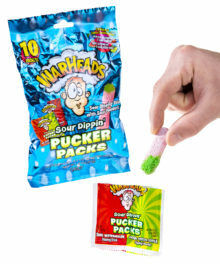 Which is why, if you want to play the full-contact pool sport known as Watermelon Ball, it’s best to get the right equipment. 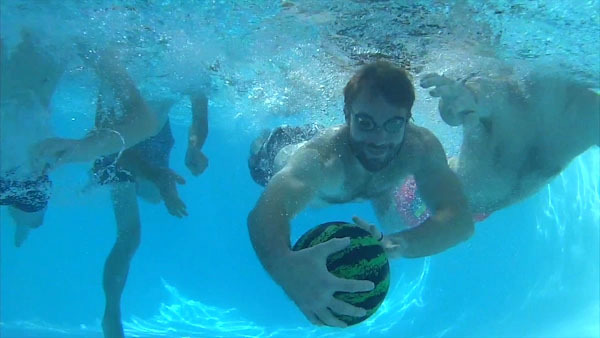 Watermelon Ball is played like an underwater version of rugby; your team tries to advance the ball across the pool, fighting your way through a physical defense. The dense vinyl ball is filled with water, so it can be bounced on the bottom of the pool and passed underwater up to ten feet! When your competitive juices run out, have fun playing with the ball as a new kind of pool toy. Much like baseball, football, and basketball before it, watermelon ball is both the name of the game and its equipment. This full-contact aquatic sport is a fun and exhausting way to get a pool workout. 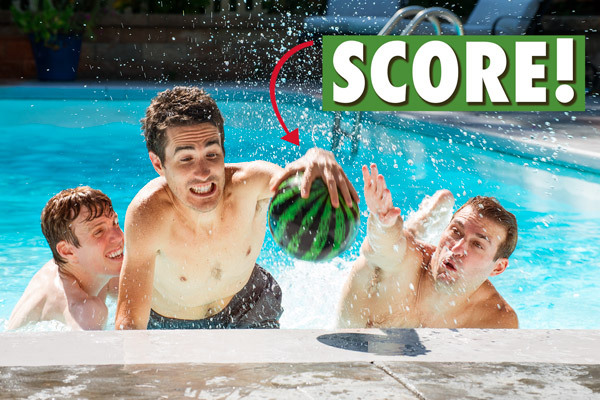 Watermelon ball is played with two teams, each trying to move the ball to opposite ends of the pool and score a goal. When your team has the ball, the defense will use any means necessary to stop you: dunks, holds, and even flat-out wrestling. The Watermelon Ball is as slippery as its namesake, so there’ll be plenty of possession changes as the teams battle in the underwater scrum. More than a splash fight. Playing watermelon ball is a hard and physical challenge, but playing around with a Watermelon Ball is easy and fun. Use the included needle to fill the ball with water until it achieves neutral buoyancy. Although heavy, the ball still floats in water, allowing you to use it in new and interesting ways. Before the game starts, master your handles by passing the ball underwater and bouncing it off the bottom of the pool. Then use those skills to shred the opposing defense and slam the ball on the deck for a goal. 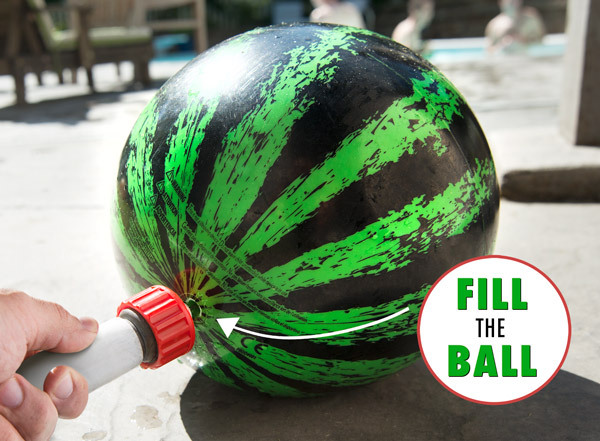 Use the included hose adapter to fill your watermelon ball with water. 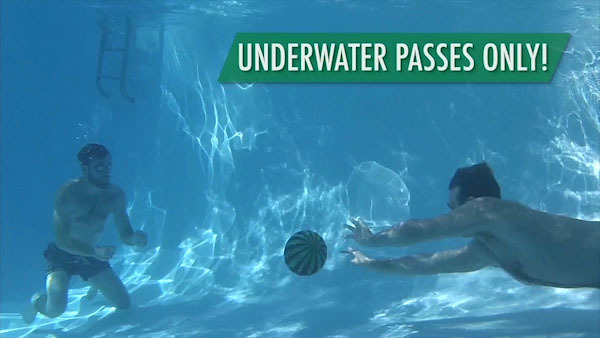 You're only allowed to pass the ball underwater. Get competitive, but don’t go off the deep end. Question: Why is this styled like a watermelon? 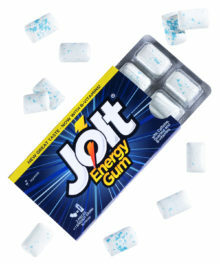 Answer: The original game was played with the actual fruit. For durability and ease of cleanup, the game has evolved to include its own ball. 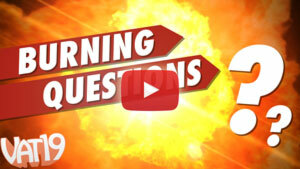 Question: What rules do I need to know before I play? Answer: Watermelon ball is a game designed for simplicity. The biggest rule is that you can’t pass the ball above water. 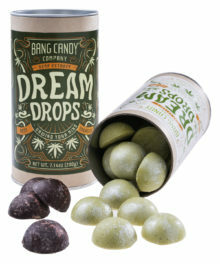 Other than that, have fun and stay safe!